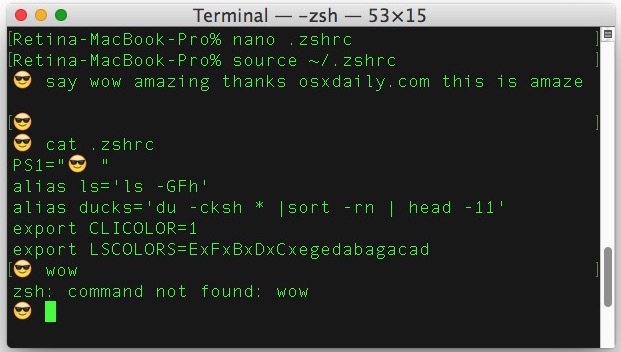 For anyone making customizations to their command line appearance, prompt, adding aliases, a new PATH, setting environment variables, or otherwise changing their bash_profile, bashrc, zshrc, and related shell profiles, it’s helpful to know how to quickly reload the profile. Many users simply launch a new shell or open a new terminal window, but there is no need to do that, there’s a way to directly refresh the profile in use thanks to the source command. This is much easier and faster than launching a new shell, give it a try the next time you’re making adjustments to your command line initialization files. And yes this works in Mac OS X Terminal as well as linux. Thanks for this post. I wondered how to do this. Posts concerning any and all things regarding the Terminal and related functions, (commands, shells, scripting, etc..), are most welcome and highly anticipated! * .bashrc is run when bash starts an an interactive non-login shell. I put variables in .bash_profile and aliases in .bashrc. Or just invoke a new login shell and reload them all at once. You can set up your .bashrc file to be portable between operating systems (that run BASH). You can also customize your .bashrc file to be dependent on who you are and on what host.